On the 17th of April, AXIS-CRUDE joined DavidNews.com. Today the project is online exactly 5 days. It’s a Sticky Listing project that calls itself a cryptocurrency investment company. The HYIP admin must be a big fan of pyramids, which can be seen in the logo of this program. Now, I have reinvested in AXIS-CRUDE $360 and will inform you about the progress of this program. It’s time to explore this pyramid and see what it can offer us. From time to time I am reviewing HYIP’s, which looks like the industry standard to me. I mean, you open the website, you look up for some extra information and you realize that it’s a classic one. Especially, if it’s a new program and you can find information about it only in a few cases. Yes, AXIS-CRUDE can be placed in the group of standard HYIP’s. You must understand that it’s good to be a standard when there are an enormous amount of poor quality HYIP websites. I like this website because the main page has a clean layout with just a few elements, which makes you stay on it and read more about the program. You might have noticed some admins trying to put everything above the fold on the home page which often results in too much information and visual elements. However, this is not the case and here you see a special offer – 5% cash back on every deposit made until the 26th of April and “Register Now” button. AXIS-CRUDE offers communication through several different channels. You can reach support or admin through e-mail. Interestingly enough there is a separate e-mail address for getting in touch with the admin. Probably, someone would like to do that. Moreover, they have WhatsApp support and online chat. I’m not sure if it’s online because it has been in idle mode with text “Offline” for the last half an hour while I’m writing this review. However, I would appreciate if any of you might add a comment in the chat box and let me know about their support service. Sharing is caring, right? You might have been waiting for the past couple of the paragraphs to find out my opinion about their investment plans. They look realistic to me at first sight. 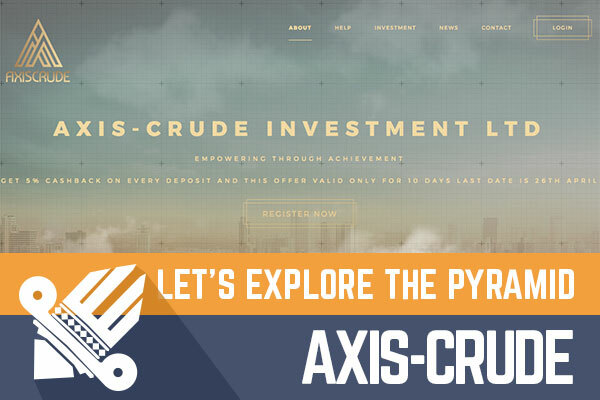 AXIS-CRUDE has two investment plans. Plan A – 3% daily for 50 days and plan B – 4% for 45 days. At first sight, the plan A looks more like affordable plan due to its min deposit - $10. The plan B has a min deposit of $8100, which is quite a lot even for pro players in HYIP industry. Most of the programs will show you only return after days, but in this calculator, you can see also daily revenue. This is a good thing to have, to help to evaluate the potential benefits. $200 investment in the plan would generate $6 a day and would reach a break-even point in 34 days. Of course, many things can happen to any HYIP in this time. Keep in mind that initial deposit is included in payments and you will not receive it. Therefore, you must do your own calculations. I must admit that AXIS-CRUDE has very simple and easy to understand website and investment plans. There are a few possible technical improvements, to improve the user experience. By the way, I have almost finished the review and online support still says “Offline”. Probably, we are in different time zones. In terms of investments, any HYIP is a high-risk investment and you must remember it that most programs will stop one day when nobody will expect it. Yes, this program offers realistic % rates, which might work. Any promotions and free offers look suspicious, but admins make them, to reach virality. As usually, I’m here to share my experience and thoughts, but no to suggest investing in any HYIP. Therefore, if you ever decide to make any investments, don’t invest more than you can afford to lose! If you have noticed something interesting or unusual about this program, please share your thoughts in the chat box. Cheers! Investment plans: 3% up to 4% daily for 45 up to 50 calendar days, initial deposit included in the payments.